Catch it if you can, baby! 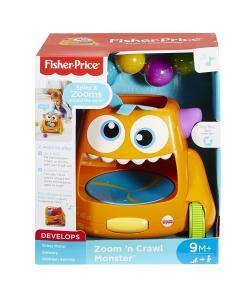 For a zooming, spinning, ball-popping good time, the Fisher-Price Zoom 'n Crawl Monster has it all. With two exciting ways to play, the zany fun can grow along with your little one. For sit-at play, little ones can fill the monster with five colourful balls, then bat at the roller ball to watch them spin around in its belly and spill out. Fun songs and silly phrases make fill and spill play even more exciting. 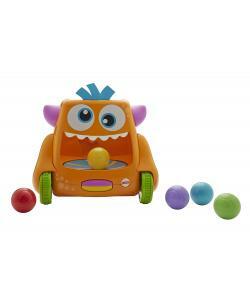 When they're ready to crawl, their silly monster friend starts zooming around the room, spinning and tumbling the balls out as it goes, encouraging babies to chase after the cruising monster or the balls! And this friendly monster has more than 15 encouraging phrases, songs and sounds to keep your little one chasing again and again. Development also comes into play. 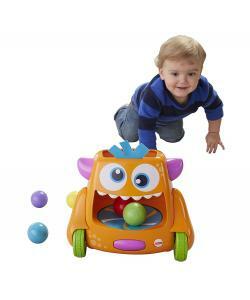 This silly monster encourages your baby to crawl and play—strengthening little muscles along the way! A variety of textures, bright colours, silly sounds and zooming moves stimulate your baby's developing senses. Discovering all the ways they can make their silly monster friend move introduces little ones to cause & effect!